The need for schools to have a clear vision, a core set of values and a strong ethos that underpins all that they do as a school and that are communicated clearly to all major stakeholders is more important than ever. 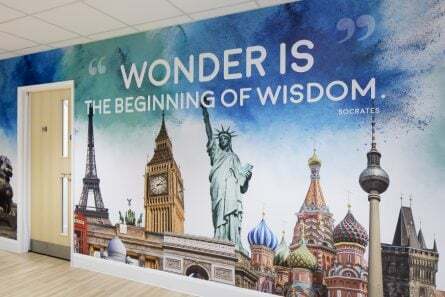 The digital age we live in has opened up the world for our pupils providing them with an amazing place to learn and broaden their minds but it also brings with it exposure to so many ways of thinking it is hard for our pupils to pick our what is right and what is wrong sometimes. In 2015 the DfE launch the first Character Awards for schools. Encouraging ‘British Values’ has increased in profile and importance, especially with the Counter Terrorism Act and Prevent duty emphasising a school’s responsibilities to promote these values. Nicky Morgan spoke at the CBI Annual Conference about the importance of character in education in order for children to be successful in their adult life and in the workplace. “Pupils who are confident, motivated and resilient will be better prepared for adult life and we believe they will get on better both in education and employment.” Nicky Morgan (9th November 2015). So how can schools be promoting the right attitude and values for pupils to be successful now and in their future and the fundamental values of British citizens? Creating a vision, along with a set of values to reflect them, is a daunting task. How do you encompass all that underpins your approach in a few words? Why not try one of our vision and values workshops to help you create or re-establish your values? Once you have set your values, embedding the values within everyday life can be even more of a challenge. All to often, once decided, the pressures of a busy school life take over from devoting the time you need to promote your vision and values to your school community. For pupils to be the best that they can be they need to be working together towards a common set of goals and values that are clear to them and all who work with them. First and foremost, children learn by watching and copying. 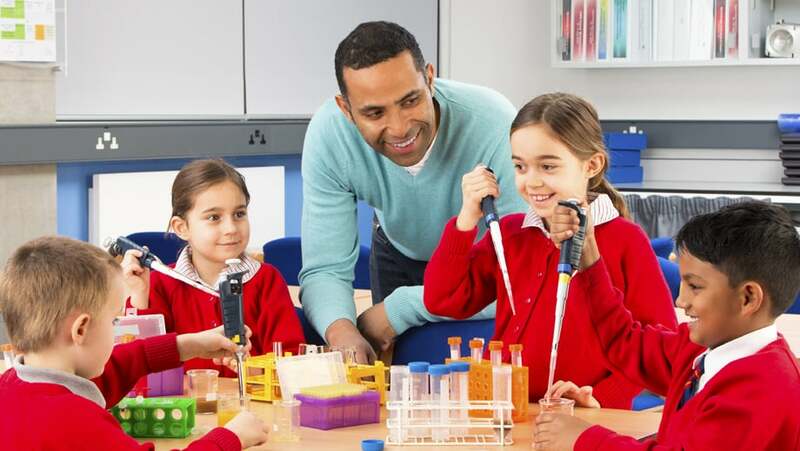 As educational practitioners well know, a large percentage of pupil’s learning will come from watching values and skills exhibited by those around them. Children just love to copy and act out being older than they are, so modelling from other pupils and staff has a huge impact. How you interact with colleagues, with other pupils, with parents and with the community sends out strong messages to pupils. Embedding your schools values into day-to-day life is important for making them a natural part of each pupils understanding of the world. Everyday activities that focus on developing character and values, not just a few planned lessons, will embed it as an underpinning part of the pupils lives, for example, giving responsibilities, policies and expectations for behaviour, competitive sport, activities/work within the wider community and work experience opportunities. All of which go a long way to developing a pupil’s ability to show their initiative, contribute to the lives of others and gain respect for and tolerance of others. Character and values are an essential part of the hidden curriculum but also need to be explicitly taught. A well-planned SMSC curriculum woven across all subjects is essential in teaching pupils the values they need in order to succeed such as resilience, aspiration, determination, tolerance, respect and team spirit. UNICEF’s Rights for Children can provide an excellent framework for teaching children about values. Debates in school elections and enterprise activities are a favourite amongst the student body and a great way to raise self-esteem and confidence as well as teach the fundamentals of democracy and workplace attitudes. It is key to teach pupils the language of values as this will make them easier to understand and more tangible, alongside raising their importance to your pupils. Outside of the curriculum, extra-curricular activities, school council/student voice groups and various team activities provide a forum to extend pupils understanding of key values and promote character. Some schools focus on one value a week and some one per month through assemblies, PSHE lessons and dedicated class slots of 10 minutes a day or half an hour a week. In one school I have been to recently, I saw ‘Value Ambassadors’, which were representatives from across the classes, who champion the values to their peers, which is also a great contribution to those individuals self esteem building. In infants I have seen some fantastic stories that convey the values. Using a range of regular stories focusing on the value of the week/month is great for younger children, especially when followed up with role play or hot seating which the always enjoy. Scheduling regular time to spend on values and a specific person or team to be responsible for promoting them is definitely a positive way of helping your pupils and parents understand and become part of your overall ethos. Pupil’s surroundings have an impact on their positivity and attitude to learning. We also give very clear messages through the organisation of our classrooms and everything that we display around school. An accessible and well-organised classroom makes it easy to access learning materials and sets the tone for learning. Displays can be a very useful tool to teach subject knowledge and skills so it makes sense to make full use of them to promote and teach values. 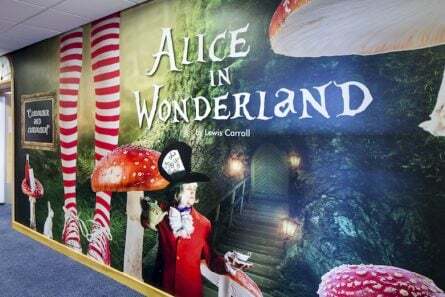 The wall space in your school can help you to promote the language of values, raise aspirations and encourage enthusiasm and creativity. With a strong foundation children will develop strong core values of their own. Schools have a significant part in the preparing the future generation for their life as adults which is both a responsibility to always be mindful of as well as an an exciting and worthwhile opportunity to be a part of. However you approach it, if your school’s vision and values are clear and well thought out, your message will be simple and inherent. 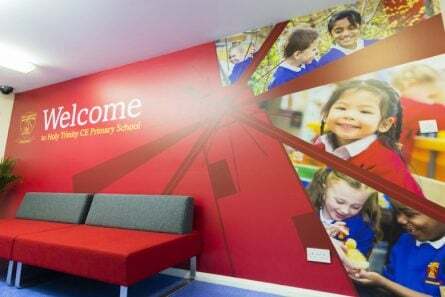 If you would like to find out more about how you can use your environment to communicate and promote your visions and values, take a look at our work with Longfield Primary School.